"Elm Memorial July 1981 by Bill Witt"
Images of the sculptures Monument to the Elm and From Tragedy to Triumph near the campus of the University of Northern Iowa in Cedar Falls, Iowa. 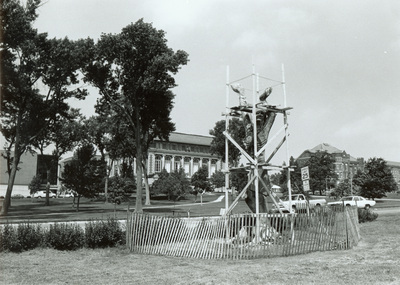 Monument to the Elm, by John Faust, was installed at the Lutheran Student Center across from the university campus in 1974. From Tragedy to Triumph, by Lewis Balentine, was installed at the same location in 1995. "Elm Memorial July 1981 by Bill Witt" (2019). Art on Campus Photographs. 81.